The EU-FOSSA project developed by European institutions is aiming at improving the security of Open Source Software. As part of EU-FOSSA 2, the European Commission is organising several hackathons where developers from both the projects and the European Institutions that rely on their software, can come together. With over 50 participants, the first hackathon focused on PHP Symfony and API Platform. It took place in Brussels on 6 and 7 April 2019. During the hackathon, some of the most active developers from the PHP Symfony community got together, many for the first time. Their time together was spent working on important issues for the community and the EU institutions such as new features and security. The participants worked on different activities, not only coding but also reflecting on different topics such as diversity within the community. 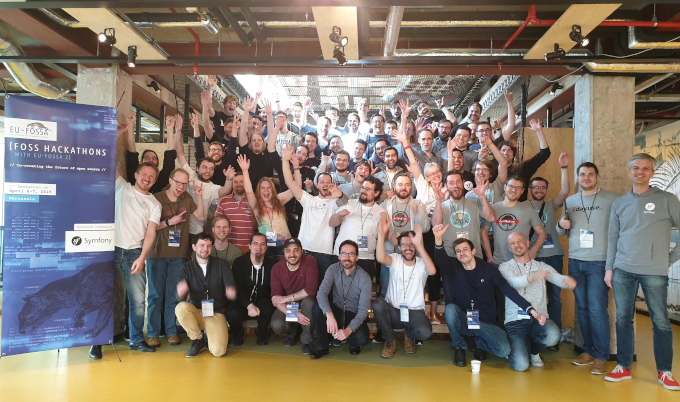 It’s been great to have 59 contributors from the Symfony, API Platform and Doctrine communities in one place to work on open source projects together. Massive thanks to the @EU_Commission for funding such an event! Two years ago I promised @nicolasgrekas to document how to configure the #symfony cache component. This weekend I finally managed to gather all the resources and create the PR. Thank you @EU_Commission and everybody that helped me. Thanks to #EUFOSSA #FOSSHackathons, @doctrineproject finally managed to throw in some focused work on automating the release flow, hopefully speeding up PR triaging by a huge lot!